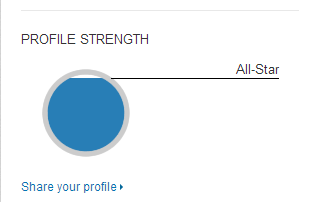 Are You Using LinkedIn’s NEW Profile Strength Indicator? There are five levels of profile strength. platforms. “Let’s put the social into Social Media. Are you Using LinkedIn’s New Home Page Updates Share Drop Down? the blue Twitter bird and it wasn’t there. how to leverage two social medias and SHARE the information on both LinkedIn and Twitter. Happy sharing to whoever you want to connect with! !